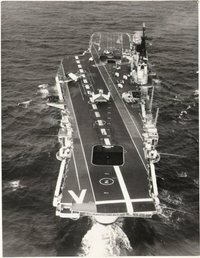 The aircraft carrier HMS VICTORIOUS was the fourth Royal Navy vessel to have the name. She was the second of six Illustrious class carriers designed and ordered during the late 1930s and the third ship completed. The other Illustrious carriers were HMS ILLUSTRIOUS, HMS FORMIDABLE, HMS INDOMITABLE, HMS IMPLACABLE and HMS INDEFATIGABLE. After serving in the Second World War, five of the Illustrious carriers were scrapped during the 1950s. 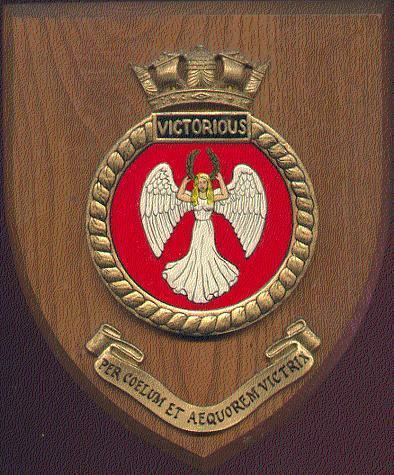 Victorious continued in service until 1969. HMS VICTORIOUS was laid down on 4 May 1937 at Walker-upon-Tyne. The ship was launched on 14 September 1939 and commissioned on 29 March 1941. Following action in a number of theatres during the war, Victorious was used for training and to transport troops, civilian passengers and equipment to and from Australia, the Far East and the UK. From 1950 Victorious was removed from service for a major refit, including a new flight deck. Whereas when entering service in 1941 Victorious was capable of carrying 36 propeller aircraft, after refit it would be able to carry up to 55 aircraft including heavier jets and helicopters. 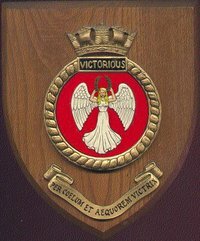 Victorious was paid off on 30 June 1950, with modernisation work beginning in October of that year. The ship was recommissioned on 14 January 1958. She operated Sea Vixens until 1967. 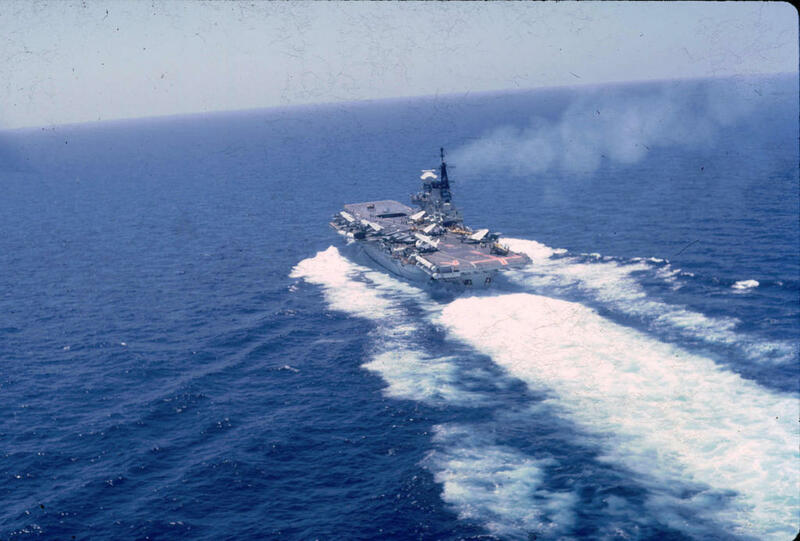 From 1958/67, HMS VICTORIOUS spent time in the Mediterranean, Middle East, Far East, Australia and off the coast of West Africa. The ship was damaged by fire in the CPO's mess during refit of 1967. The refit was terminated. In 1968 she was decommissioned. In June 1969 HMS VICTORIOUS was sent to Faslane on the Clyde and scrapped. Archive: Cdr. (F) D. Hamilton RN. From 20 to 27 May 1941, took part in the chase in the Atlantic and sinking of the German battleship, Bismarck. Victorious sent out Swordfish torpedo bombers, one of which hit the Bismarck amidships. Victorious aircraft hit Bismarck starboard side abreast the bridge. Being only an 18" torpedo it did not penetrate the armour plate. The shock wave killed one and injured 6 and the violent evasive movements of the ship further increased the damage and also the rate of fuel oil leakage. In November 1942, provided cover during Operation Torch, the North Africa landings. Temporarily loaned to the United States Navy and named USS Robin. The USN were temporarily short of Aircraft Carriers in this period. During May and June 1943, supported action in the Soloman Islands, New Caledonia, Munda, New Georgia and Bougainville. On 3 April 1944 took part in Operation Tungsten; an attack on the German battleship Tirpitz in Alten Fjiord, Norway. Barracuda attack scored 14 hits on the Tirpitz causing severe damage. July 1944, Operation Crimson. Led strikes on Sabang harbour (Sumatra), the first time British naval forces brought guns to bear (as opposed to air strikes) on Japanese shore installations. Admiral Lord Mountbatten, Supreme Allied Commander, South-East Asia, signalled, "The results will hearten all forces in south-east Asia". April 1945: Operation Iceberg. Strikes against airfields and other targets in the Sakishima Island group at the southern end of the Ryuktu Islands.